Groove Groove everyday sofa bed with storage backrest. Convertible into XL single, French double, standard double or king size beds, with a h.14 mattress. Jack Jack by Milano Bedding is a sofa bed for kids. Available in several configurations, with different armrest and backrest models and many optional accessories. Garrison Garrison is a made in Italy upholstered square ottoman with weaved or tight edges and refined feet. Ideal combined with the same name sofa or by itself. Moorea Moorea is a bed with tufted rounded headboard. A space-saving bed with slim bed-frame, ideal for master bedrooms and kids bedrooms. "Technology and quality are practical means to narrate, to express yourself, but also to excite"
Milano Bedding is not just a factory producing comfortable sofa beds with an elaborate design: we design and produce high quality hand-crafted sofas, upholstered beds, ottomans and transformable armchairs with the greatest attention to details. All our creations are manufactured to last through time and most of all to provide you and your guests with the best comfort. 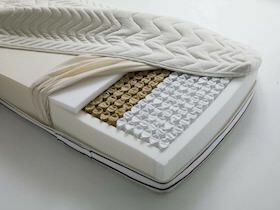 Milano Bedding transformable products are beautiful, versatile and functional because they are equipped with comfortable thick mattresses, and easy-to-use high quality opening systems: in order to guarantee high performances through time, we only employ Lampolet mechanisms and Springs mattresses. Our fixed sofas and our beds are made with upholsteries of the highest quality, and are completed by cushions and mattresses designed to provide the best support, covers suitable for every environment and lines designed to fit any space need.